An alternative to Termidor SC, Taurus SC is a water-based suspension concentrate of 9.1% Fipronil for Pre and Post-construction termite applications, and to control perimeter pests. It is labeled for barrier applications targeting occasional invaders around structures. 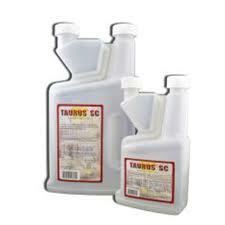 Taurus SC should be applied at a rate of 4 gallons of dilution per 10 linear feet per foot of depth. Would you like to see the Taurus SC Label? How about the Taurus SC MSDS sheet?